Originally built to become the Swiss ambassador official residence at the start of the previous century this period palace has now become your hostel! Set in front of the city's most beautiful and nostalgic view point (Miradouro Sao Pedro de Alcantara), in the heart of Bairro Alto, The Independente offers both the chance to stay in a premium location as well as the comfort sought after by any backpacker. A restaurant, a bar, a guest's only lounge and a secluded beer garden where locals and travellers alike meet every day are part on the Independente experience. Everybody says that ff you want to know a city you must know its locals! 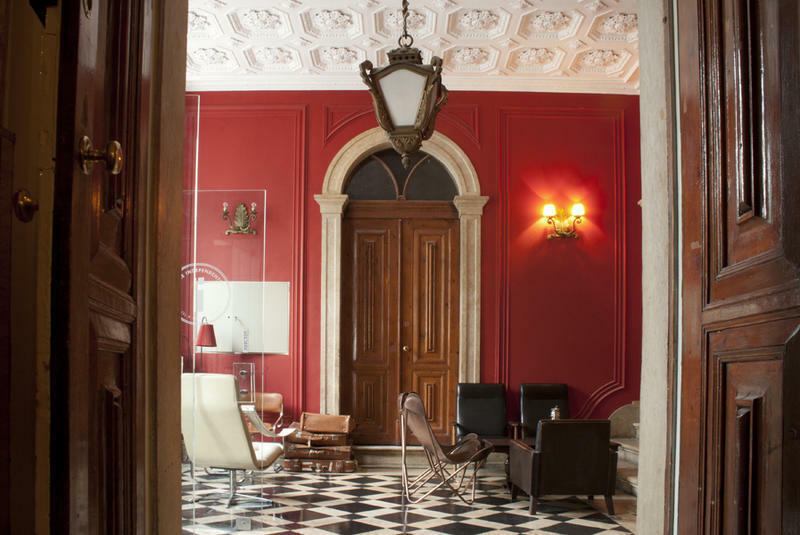 Four very special suites with private balconies which overlook the Tagus River and the St. George's Castle flatter the palace's existence and are secluded enough, with direct access by elevator, for a couple or a family to enjoy their privacy. Aerobus: Catch the AeroBus Line 1 (city center bound). Stop at Restauradores and take the Elevador da Gloria (street funicular/elevator at 1,40€ + 0,50€ for the rechargeable travel card aka Viva Lisboa Card) all the way up to the Sao Pedro de Alcantara Street viewpoint. Find us at number 81. Subway: Find the Airport station (red line) and head to S.Sebastiao . Change to the blue line (direction Santa Apolonia) and then stop at Baixa-Chiado and choose the Largo do Chiado exit. Again, we're 550m away at Sao Pedro de Alcantara Street viewpoint, number 81. Jump in at Jardim Zoologico (blue line) Santa Apolonia bound. Get out at Baixa-Chiado and make your way to the Largo do Chiado exit. You can walk to the hostel: just go up by Rua da Misericordia until you find the Sao Pedro de Alcantara Street viewpoint. Its 550m or a 5 minute walk. Right there you will find The Independente. Jump in at Santa Apolonia (blue line), Amadora Este bound. Exit at Baixa-Chiado and follow the signs to Largo do Chiado. Walk up Rua da Misericordia until you find the Sao Pedro de Alcantara Street viewpoint. We're at number 81. Find the Oriente station (red line) and head to S.Sebastiao . Change to the blue line (direction Santa Apolonia) and then stop at Baixa-Chiado and choose the Largo do Chiado exit. Again, we're 550m away at Sao Pedro de Alcantara Street viewpoint, number 81.